In February, Serif launched a beta version of its image editing application Affinity Photo. The software is a Photoshop alternative designed specifically for Mac OS X, and the beta has been�updated several times since the February�launch. Yesterday,�Serif took the software out of beta and officially launched it in the Mac App Store for users�running OS X 10.7 and later. 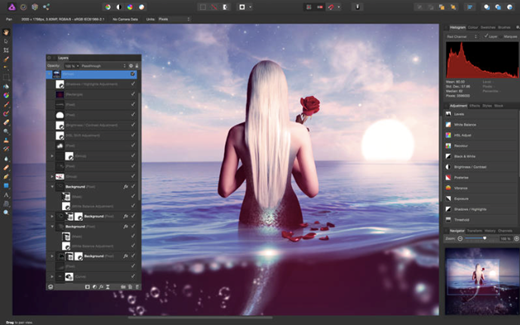 Affinity Photo is hailed as a Photoshop alternative that is considerably cheaper while retaining the same variety of pro-level features Photoshop users require.�Serif’s software supports Photoshop’s PSD files, as well as ‘all standard formats’ like JPEG, GIF, PNG, and TIFF. There’s full 16-bit channel editing, RGB/CMYK/Greyscale/LAB color spaces, Raw support, advanced lens correction tools, correction and retouching tools like Liquify and red eye removal, the ability to create custom brushes, and more. Affinity Photo’s regular price is $49.99 USD, but until July 23 the software is priced at $39.99 USD. English, German, Spanish, and French languages are supported.